During the exhibition in August, this picture was brought in by Mrs Rosemary Frost of Norwich, who is a cousin of Peter Topps and Mary Owen (nee Topps). The picture is believed to show the pupils of a small private school that was in Bottesford at the turn of the 20th Century. The teachers standing at the rear of the picture may well be sisters Nellie (Ellen) and Beatrice James. The 19th Century censuses tell us that the girls were the daughters of Francis and Louisa James. Francis James was a blacksmith born in 1841 in Bottesford, and Louisa was born in 1841 in Cambridgeshire. That for 1881 records the family at 5, Church Street (then within Easthorpe) consisting of blacksmith Francis James aged 40, Louisa also aged 40, and their daughters Ellen H James aged 10 and Beatrice H James aged 6. Also in the house were blacksmith Thomas Sentance (60) and apprentice blacksmith Alf Hardy (18), servant Hannah Geeson (13) and retired cook Frederick Hills (41). Frederick Hills was apparently Louisa’s brother, but the census does not say why he was retired. The census for 1891 give the address as 6, Church Walk in Bottesford. Francis is now a retired blacksmith, though only 50 years old, and there are no employees, apprentice or servant recorded. That for 1901 gives the family address as 7, Church Street. Ellen is living with her parents but Beatrice was not at home on census night. Three addresses are given, but it is not certain that these indicate different houses. Addresses were not consistent in the 19th century. Several people remember Nellie and Beatrice in later years, when they lived in what is No.6 Church Street at this day. This is on the southern side of Church Street, which was counted as Easthorpe in 1881, the boundary with Bottesford itself running along the centre of the street so that houses on either side were numbered separately. This No.5 Church St in Easthorpe in 1881 could well be No.6 Church St today. The address was No.6 Church Walk (i.e. Church Street) in 1891. In 1901, the James’s address was No.7 Church St. Today, this is a house on the opposite side from No.6, but can we assume that this was the case in 1901? Rather, might the No.6 of 1891 have been re-numbered as No.7. Further research is needed to resolve this point. A headstone in the eastern part of Bottesford churchyard commemorates the passing of Ellen (Helen Mills James) in 1953 aged 85 and Beatrice Hannah James in 1959 aged 85, in addition to their parents Francis James (d.1911, aged 71) and Louisa James (d.1930, aged 90). The information leaves some uncertainty about Ellen James’s name (Was she Ellen or Helen? Was her second christian name Mills or Hills?) and date of birth (1871 or 1869). There is no apparent reason to query Beatrice Hannah James’s name or year of birth (1875). Mrs Ingrid Sellers remembers the sisters in their later years, sharing No.6 Church St. She tells us that Nellie had a Dancing School in Queen Street, in the Co-op Hall. She taught all ages Modern Dancing of that time. Iris Taylor and Flo Barnes apparently also taught at the School for Miss James. Mrs Sellers was a pupil there. One had to go up a flight of stairs to one long room. There was a little cubby hole area where the pupils used to hang their coats. In the room there was a round stove with a lid on the top that lifted off and to provide heating for the room. The floor of course was wooden. Mrs Sellers recalls the windows were to the front facing Queen Street, and that there was a piano in the room and chairs all around. She also recalls that the Railway Men used to have their meetings there. Beatrice James was a music teacher. She was also the Choir Mistress and used to wear a cap and gown. Mrs Sellers and her daughter Brenda Turier were both taught to play the piano by Beatrice! Can you tells us more about these well remembered Bottesford ladies? The older of the two boys in the picture is 8 year old Val Green, the son of the late Valentine Green, architect and surveyor of 1, Mill Lane, Bottesford. 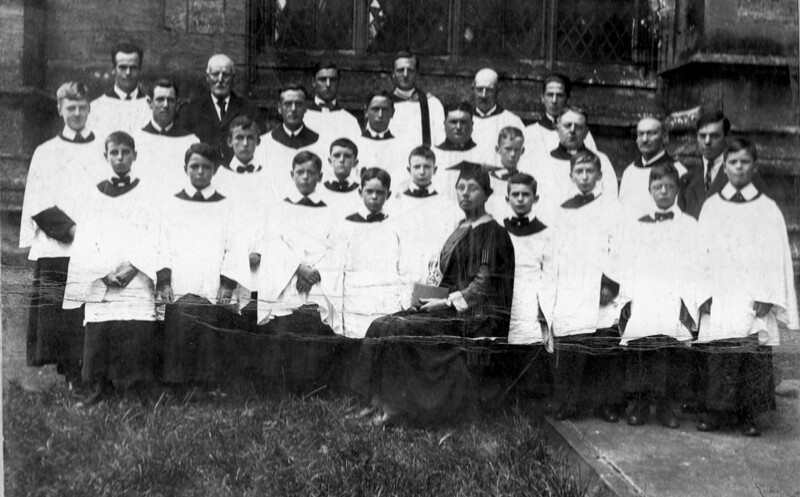 Valentine Green junior (right hand end of middle row in photograph) was born in Bottesford, but by 1901 lived with his mother, Ada, and his step-father, solicitor Frank Robinson, at 19 St. Peter’s Hill, Grantham. 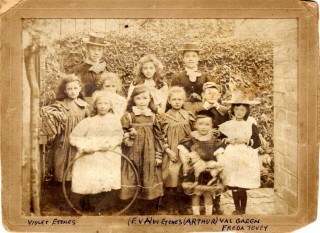 He has an 8 year old brother, John, and a 7 year old sister, Alice Lilian, who may be one of the girls in the photograph. The second boy is little Arthur Cecil Geeson, here only three years old, holding his toy horse and still wearing a dress. Arthur and his sister Edith (6) may have come to Bottesford from London to live with their father’s family after the death of their mother, Ellen, in 1898. Possibly Edith is one of the other children in the picture. Twelve year old Violet Etches is one of the three daughters of Charles Etches, a Nottingham man, described in the 1901 census a ‘living on his own means’ at 1, Belvoir Road. (Formerly 1 Mill Lane.) Of his other two daughters, Edith (9) may be in this picture, but toddler Dorothy (3) seems too young to be one of the unnamed girls seen here. Freda Tovey is presumably the daughter of Mr Tovey of London, who took the photograph. She may be Elfreda Tovey, the 8 year old daughter of H.V. Tovey, journalist and author, of 55 Denmark Hill, Camberwell. This page was added on 10/09/2008.